India's paper industry now sources more wood from farmers. Why does it still demand forestland? Kari Papa Rao of Chodavaram village in Telangana’sKhammam district has been growing eucalyptus since 2001. After three successful harvests, Rao is preparing to plant the trees for the fourth time on his 28 hectare (ha) farmland. Once in every four years, he fells the trees that earn him more than Rs 50 lakh. Earlier, Rao used to grow chilli. “It fetched me a good profit but required a lot of investment and labour. Its market price also fluctuates significantly. “Eucalyptus has an assured market. Besides, it does not need constant care like other crops,” he says with a smile. Rao buys hybrid variety of eucalyptus saplings from a nursery in Bhadrachalam, set up by ITC Ltd, the second largest paper manufacturer in the country, and sells the pulpwood to the company. Rao is one of the 80,000 farmers in the country growing pulpwood for ITC. Between 1992 and 2013, the company distributed 788 million saplings and promoted eucalyptus plantations on 168,000 ha in undivided Andhra Pradesh, Tamil Nadu, Maharashtra, Chhattisgarh, Odisha, Kerala, Uttar Pradesh, Madhya Pradesh, Punjab and Haryana. ITC’sBhadrachalam unit, the biggest wood-based plant in the country, sources 95 per cent of its raw material from these plantations. Other wood-based paper mill giants, such as JK Paper Ltd, also source most of their raw material from plantations on farms. Yet, it is surprising that the paper industry is adamant on reverting to its old practice of sourcing wood from forests and is demanding forestland from the government. Till the 1980s, wood-based paper industry, which rolls out high-quality paper, sourced most of its raw material from forests and was responsible for large-scale forest loss. In 1988, the Centre introduced the National Forest Policy, which restricted commercial plantations in forests and asked industries to source wood from farmers instead. The paper industry with its eye on cheap wood from captive forests opposed the policy, claiming that farm forestry would not be sufficient to meet its needs. However, in the absence of choice, the industry turned to farmers for wood. The movement of farm forestry began to pick up towards the late 1990s. This heralded a remarkable change in the way wood is sourced by the paper industry. Though the industry predicted in the early 2000s that a “wood drought” was imminent, its investment in farm forestry seems to have paid off. According to a recent report on the pulp and paper industry by Delhi non-profit Centre for Science and Environment (CSE), in 2001, the industry produced 4.8 million tonnes (MT) of pulp and paper. Of this, only 1.7 MT was made from 3.4 MT of wood and bamboo. The rest was made from agro-waste and waste paper. In 2011, nearly 3.1 MT of the total 10.1 MT of paper was produced from 6.5 MT of wood and bamboo. “This two-fold increase in consumption of wood has been possible as these mills had opted to take the farm forestry route,” states the report, which studied 12 large wood-based integrated mills. It found that 61 per cent of the wood consumed by these mills was sourced from farm forests in 2013. The contribution of farm forestry was just 23 per cent in 2004 (see ‘Sustainable sourcing’). The industry’s demand for wood will increase in the days to come. Though the percentage of wood-based paper has come down to 31 per cent in 2011 from 84 per cent in the 1970s (see ‘New writing on the wall’ on p38), the actual consumption of wood has increased because of increasing paper production. By 2021, the wood-based paper production is expected to double to 6.1 MT from its 2011 level, CSE estimates. “Sourcing wood from farm forestry is a win-win situation for both wood-starved mills and farmers who want a steady source of income,” says K SrinivasaRao, ITC’s field manager in Bhadrachalam. The industry has put in a lot of research to make farm forestry work. Initially, not many farmers were willing to grow eucalyptus because of high gestation period, poor yield and low market price. They had to wait seven years for harvesting only six tonnes of pulpwood from a hectare. This would sell for just Rs 75 a tonne. Now farmers like Rao harvest nearly 80 tonnes of pulpwood from a hectare in four years, which they sell at around Rs 3,500 per tonne. “Our company researched from 1982 to 1989 to develop high-yielding seeds,” says H D Kulkarni, ITC’s vice-president in-charge of plantations. “We developed 107 high-yielding, drought-tolerant and disease-resistant eucalyptus varieties, 12 varieties of subabul and 15 varieties of casuarina suitable for different soils.” ITC also set up two nurseries and gene banks at Bhadrachalam. “Productivity has improved from traditional three to six tonnes per ha to an average 80 tonnes per ha. And compared to 40-50 per cent survival rate of normal seed route plants, the hybrids have 95 per cent survival rate,” says Kulkarni. To promote plantations, ITC rolled out two programmes. Under the first one, big farmers like Rao buy plants from the company at full cost, which is Rs 5 per plant. Under the second programme, the company promotes social forestry by roping in backward communities. Each farmer pays Rs 1 per plant to the company and deposits the remaining Rs 4 in a group fund, from which he or she can avail loans. Like ITC, a few mills such as JK Paper Ltd and West Coast Paper Mills Ltd have taken to farm forestry. JK Paper today sources more than 85 per cent of wood for its unit in Rayagada district in Odisha through farm forestry. Before 1994, the company depended on government forests in Odisha and Gujarat for bamboo. JK Papers began its farm forestry programme in 1991. The mill provides high-yield planting material and free technical advice with the assurance of buying back the wood from farmers. To minimise transport costs, the company’s farm forestry focuses on areas within 200 km of its mills. JK Paper started a purchase-at-gate scheme in 2009, enabling farmers to deliver wood and be paid at the company’s gate. It has a network of 10 wood collection centres for farmers who live within 75-200 km from the plant. Since its inception, the programme has promoted plantations in 110,000 ha of farmland covering 20 districts in four states. 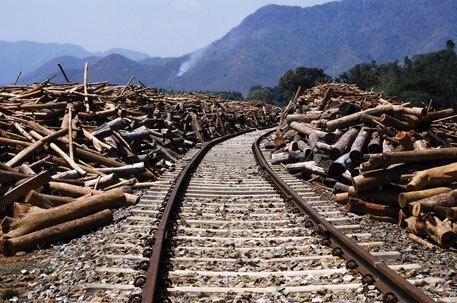 In 2013, the success story hit a roadblock which prompted the paper industry to import wood. 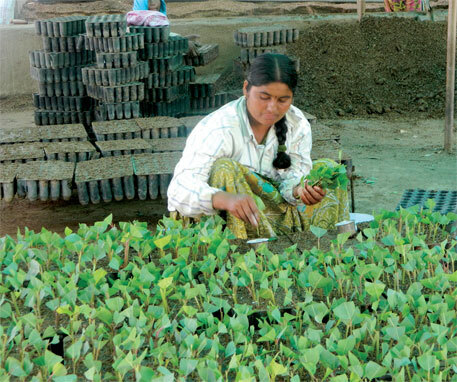 “Despite extensive farm forestry initiatives, we faced shortage in 2013. As a result, we had to import more than 70,000 tonnes of wood for the first time,” says DharmendraDaukia, general manager, raw materials, JK Paper. Daukia attributes the shortage to three problems. In 2008-09, the market price of wood crashed to Rs 1,500 per tonne as paper mills hit by the economic recession did not procure wood. That year, the deadly gall disease hit eucalyptus plantations across the country. The government offered a high minimum support price for food crops. “In several areas farmers went to the extent of uprooting eucalyptus trees to plant other crops,” he adds. 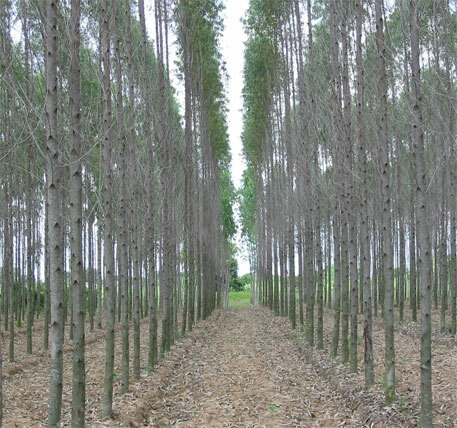 The 2013 shortage has once again prompted paper mills to say that farm forestry is not a reliable option. Kulkarni says the paper industry needs an additional 2.5 million ha by 2025 to meet its future wood demand. “Availability of land and transportation costs are also major hurdles in promoting farm forestry. Land may not always be available near paper mills or farmers living nearby may not be willing to grow pulpwood,” he adds. Another reason the industry is not willing to invest in farm forestry is the fear of wood-poaching. Other wood-intensive industries, such as plywood and pole, have started buying wood from farms promoted by paper mills instead of starting their own initiatives. Even competition for wood from within the paper industry—from mills that do not invest in farm forestry­—is working against farm forestry. This raw material shortage is only short-lived, say CSE researchers. With the industry stating that the current price of wood is at an all-time high of Rs 5,000, it is likely that more farmers will come into the fold of farm forestry. Equal engagement of all mills in farm forestry will work towards addressing unavailability issues, they say. There is another incentive for large mills to turn to farm forestry. The CSE report suggests that the wood-based paper mills which have invested in farm forestry have registered better growth than the ones that haven’t. ITC has remained the largest integrated paper mill in the country since 2000. Its capacity has increased at the rate of 12.6 per cent per annum. The Rayagada unit of JK Paper has registered 6.8 per cent annual growth since 1995. Despite the advantages of farm forestry, the paper industry is reluctant to give up its most contentious demand: access to degraded forests and government wastelands. At the same time, it has triggered a tussle between those who want forestland and those who oppose the move. A working group constituted by the Planning Commission to suggest measures to “accelerate” the growth of the paper industry during the 12th Five-Year Plan recommended leasing about 2.5 million ha of forestland to the paper industry. The Ministry of Environment, Forest and Climate Change opposes the idea of handing over forestland for comme- rcial purpose (see ‘Pulp friction’). India’s new Agroforestry Policy, finalised in April this year, is a step in the right direction. The policy is aimed at removing restrictive legal provisions for harvesting and transportation of trees planted on farmland. The policy also aims at providing quality planting material, infrastructure and support price mechanisms. These measures will give farmers the incentive to adopt agroforestry and grow wood on their farms. “We cannot keep asking for natural forests. Agroforestry is the only hope for wood and food security in the country,” says ChetanAgarwal, a Gurgaon-based forestry consultant. The CHANGING lifestyle of the Indian middle class has altered the use of paper. The growing consumption of packaged goods and disposable tissue paper has increased the demand for packaging paper. This trend is neither desirable nor sustainable. Consumer goods packages, such as tetra packs, are made of high-quality, glossy packaging boards, made from wood. Recycling of these packages are virtually non-existent; the coating makes them less useful for reuse. The growth of manufacturing industry has also driven the demand for packaging paper, such as cardboard. Today, the country produces more packaging paper than writing and printing paper. 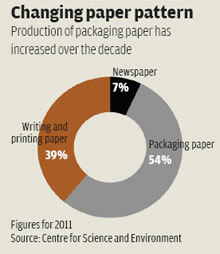 In 2012, nearly 54 per cent of the paper produced was used for packaging. The demand for packaging paper is expected to grow at 10 per cent per annum over the next decade. A large share of this paper is kraft (brown) paper, made from waste paper or recycled fibre (RCF), which has overtaken wood as the main raw material for the paper industry. In 2012, 47 per cent of all paper manufactured was from RCF. While increased use of RCF is an encouraging sign, its low recycling rate in India (27 per cent) is a major challenge. About 50 per cent of RCF is imported. Water absorbing plants like Eucalyptus,Casuarina etc., grow naturally in Hills with abundance of water (to balance water). Planting them in plains leads to huge absorption of water which leads to lowering ground water table. Think of water & food needed than paper. We should have to ban so-called "Social Forestry" projects. The huge area where farm forestry is practiced should be used for food crops and not for paper and pulp. Urban population should limit the paper consumption to very minimal. First use of paper be restricted.Though industries demand for forest land justified in the sense that farmers planting water guzzling varieties which is more harmful in long run,Suitable forest land with fixed responsibilities both for the industry as well as for the babus of government be allotted .In fact growing of forest is less energy consuming than horticulture,saving energy is saving trees .you have mentioned the package industry,in fact consumerism,and irresponsible marketing and food habit of our middle class is more responsible for degradation and destruction of our forest.Hope is that trees are fastest recyclable thing, its responsible cutting do less harm than any other industrial alternative. First things first- Casurina in India is not grow on hills. It is grown all along coastal regions of Eastern India. Mostly grown in cyclone hit areas and saline soils where other crops do not grow well or fail due to cyclones. Trees survive. Sugarcane and Paddy have huge water requirements per Unit of biomass production and is well known. Should be abandon them. - All of us want to use best quality paper, at lowest cost and with no pollution. and also we do not want the "forest" to supply wood to manufacturing plants. Now what is the best solution. - And some times I wonder should we produce so much food? Have we studied how many lac tonnes is wasted every year. If we are not able to find some mechanism for proper storage after so many years of efforts and research, why grow it and allow it to ROT. Let us grow wood to cook whatever is not rotting in FCI godowns. We will save water and energy to grow that much food and instead grow sufficient wood to cook whatever we grow. - farm land use decisions are in hands of farmers. She will do what is profitable for her. - I am not sure whether the respondent is from urban or rural area, but it would be interesting to know how will you, as an individual, reduce paper consumption over one year period. Let us layout an experiment. Weigh every kind of paper at the door of our home (even if estimates are noted it is ok, if one has good estimate skill)- bags, books/ notebooks, writing books, photo copies, packing boxes, toothpaste box, soap box/ wrapper, tissue, napkins,news paper. Do it for 12 months and see how much we are able to reduce over 12 months. And then let us pass a bill for MINIMAL PAPER USAGE. And in another article on your web site it is claimed that the new Minister Incharge MOEF Mr Prakash Javdekar has initiated for handing over forest land to paper industry. What is truth n this. Surely all of us need good paper, but do not want the undue benefit to industry at d cost of harm to nature. It should b balanced method. Firstly to reduce use of packing material which cannot be recycled extra duty be charged for such packaging & the benefits be passed on to recycling industry. Secondly in a country where millions suffer from hunger top priority should be building suficent number of ware- houses&. Diverting land meant for food for other purposes is a cruel alternative. There is plenty of waste & degraded land for other purposes. It is with state & central govt. depts. It should be used. One way is to give this land on short term lease to retired soldiers, war widows, retired govt. servants with clean service records & above average efeciency. About a couple of months back MoEF officials had told CSE/DTE that they had no plans of supporting working group recommendation - i.e. handing over degraded forest land to paper industry. Subsequently, at the time of the release of "State of the Forest", the Minister spoke about using some of the forest land for both commercial and community use, but there has been no formal communication yet. This would be a major, and potentially unwelcome, shift in policy. Agro-forestry is the need of the hour. Govt policies leading to high cost of labour,seeds, fertilisers and non-availability of electricity has made agriculture unviable.Moreover, surplus production of foodgrains has lowered its prices. It is a double blow to the farmers. It is necessary to diversify and maintain the balance. Rain-fed agroforestry is always beneficial for increasing rainfall, maintaining ground water level, dispensing with extravagant energy-needs. In fact research be done to meet food needs, from agro forestry, apart from wood. "The industry has put in a lot of research to make farm forestry work. Initially, not many farmers were willing to grow eucalyptus because of high gestation period, poor yield and low market price. They had to wait seven years for harvesting only six tonnes of pulpwood from a hectare. This would sell for just Rs 75 a tonne. Now farmers like Rao harvest nearly 80 tonnes of pulpwood from a hectare in four years, which they sell at around Rs 3,500 per tonne." I understand the increase in yield per hectare and the faster growing cycle. But do not understand why the price per tonne would rise as well. Especially a 4600% rise per tonne. Is it of such higher quality?